In original D&D, thieves ranked as the least effective character on the battlefield. However, when the party explored, thieves took the biggest role. Early D&D players spent most of their time exploring, so who cared if thieves only rarely saw a chance to backstab? This goal led to the creation of character class roles. To make sure that all characters could succeed at their roles, the designers created formulas for each role that determined things like damage output, expected armor class, and healing capacity. Then they built the classes to meet these specifications. Through the life of the edition, these parameters proved a bit off, revealing some roles as more useful than others. Fourth edition showed that only the striker role really mattered, because nothing prevents damage as well as killing monsters quickly, and no condition hampers enemies as well as dead. Roles succeeded at one thing: They told players what each class did best in combat. By choosing a role, players decided what they would do in a fight—healing, damaging enemies, or protecting allies. Without roles, a 4E novice might wrongly suppose that a warrior would do a lot of damage, and fail to select a nature-loving ranger or a sneaky thief for maximum damage output. Rob Heinsoo wrote, “4th Edition has mechanics that allow groups that want to function without a Leader, or without a member of the other three roles, to persevere. Adventuring is usually easier if the group includes a Leader, a Defender, a Striker, and a Controller, but none of the four roles is absolutely essential.” For the first time in D&D, an effective party could make do without a cleric or other healer. Also, healers could heal and still use their standard actions to attack, something every D&D player enjoys. Healers in 4E never feel torn between using actions and spells to heal, and using them to smite evil. This counted as a win for the 4E design, and counts as a virtue lost in the fifth edition. Ironically, while roles sharply defined the tactical job of each class, 4E’s design made the classes interchangeable off the battlefield. The fourth edition Dungeon Master’s Guide encouraged DMs to skip to the good parts of the game by building adventures from a series of combat encounters and skill challenges. Characters’ roles shape their place in combat, but have no effect on skill challenges, or any other part of the game. Outside of combat, all 4E characters contribute by making skill checks. Your character’s favored skill checks may differ from the next guy’s, but the rules advise dungeon masters to allow a wide variety of skills so every character can help. To guarantee that everyone contributed, the original skill challenge had players rolling initiative and taking turns. That rule soon fell by the wayside, but it shows the designers’ commitment to making all classes play alike off the battlefield. To further level play, most 4E spellcasters lack magic that helps outside of combat, a big change from previous editions. D&D’s fifth edition dispenses with formulaic roles and with classes designed to measure up to a role’s target numbers. This affects the new game less than it would 4E. In the new edition, combat encounters no longer dominate time spent playing. D&D’s fifth edition bolsters the game’s interaction and exploration pillars to balance with combat. With more time to shine at diplomacy, the bard may not mind a reduced role in combat. With time to lead in exploration, the rogue might not mind retiring as the damage-per-round champion. The real benefit of roles came from helping players understand what their character would do best in combat. This benefit can come without formal roles. The class descriptions simply need to make each classes’ tactical strengths and weaknesses clear. 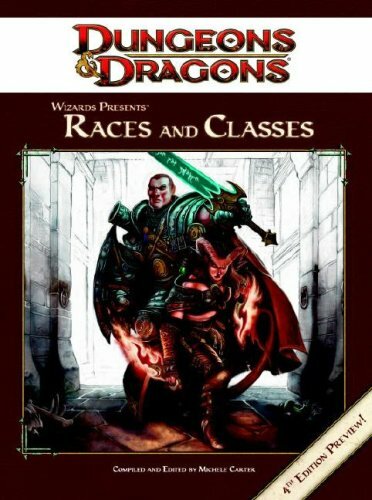 This entry was posted in D&D fifth edition, D&D fourth edition, Role-playing game design and tagged Character roles, Dungeon Master's Guide, Rich Baker, Rob Heinsoo, Wizards Presents Races and Classes. Bookmark the permalink. This, to me, is exactly what defines a role-playing game, as opposed to a tactical boardgame or small-unit miniatures game. 4e was all about combat and suffered for it. 5e has returned to role-playing, allowing the characters to do something besides fight. When I first picked up 4E Combat Roles were instantly confusing, since I saw them through the lens of previous experience with Race, Class, and Background- selectable options that combine to form the broad characteristics of your 1st Level character. I assumed that it was selectable because if it wasn’t, why would they include it? Once I understood what Combat Roles were, I thought that they would just cause confusion to new players, and this impression was borne out when we started a campaign with a bunch of players for whom 4E was their first table-top experience. We were immediately reigning in players who put the cart before the horse. It wasn’t until I started designing my own game that I found their real utility, which is as a game design tool. WotC did a great job in distilling the roles of the classic fantasy adventuring party into neat summaries that clarified and crystalized their utility individually and within the group. This was true even though they really whiffed at describing that, as they did so many elements: Any time you have a description of a Bold Headline Concept, like “Leader,” and immediately feel the need to include a sidebar explaining how that concept is not actually what it’s very name clearly states, you’ve failed and need to re-examine your assumptions rather than explain them. I’ve found the concept of tactical roles very useful in keeping Class concepts clear, and extending the description of such roles beyond combat has proved to even be a creative incentive. My core Classes are more distinct and useful, and the concept of what a Ranger can be has been deeply informed by this, and the game is richer for it. In any case, I went from loathing the very idea of the Combat Role to seeing it as almost intentionally obfuscating to not include them. My solution has been to include “Tactical Roles” in my game, but hardly mention them if at all in my equivalent of the PHB. Instead, they’re saved for the supplement I’m writing alongside, which is for advanced players and GMs, and includes more detailed and tactical information and mechanics. The tactical meta-knowledge can thus still be accessed by those who can make use of it, but it doesn’t cloud the already crowded cognition of the newb who should keep their focus on character and capability. Thanks for sharing your thoughts. Like you, I came to see some uses for roles in combat. The scheme raised two concerns: (a) roles several classes failed to line up with what players might expect and (2) the striker role proved too good a dealing damage compared to other classes. I’m pleased that my thoughts helped a bit as you work out the design for your own game.